May is almost over and I have so many beautiful swaps to share with you, I’m going to spread them out over the next 4 days here on the blog. After I came back from Fiji, being gone for 10 days, I was behind quite a bit in all areas! It was the trip of a lifetime and I wouldn’t trade it for anything but golly, that jet lag stuff is some serious business. Matt bounced right back into this time zone but I’ve been so sleepy during the day and wide awake at 4 am! 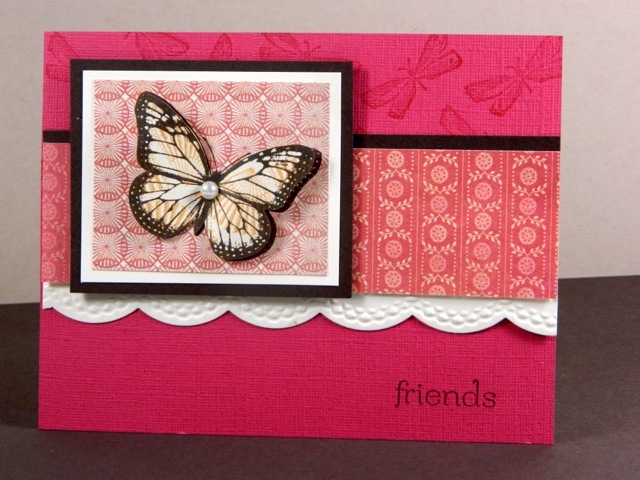 With May almost over, so is the current Stampin’ Up catalog! There will be a little overlap this year from the retiring catalog and new one, which starts May 31st. The Retiring Stamps will be available until June 3, 2013. Accessories available until June 3rd but until supplies last and some have sold out already. Be sure to check your catalog against the retiring list to be sure you have what you want before they are gone. If you like to shop visually, go to my SU website HERE to see the retiring products. I wasn’t crazy about this paper in the Spring catalog but them I see this pretty card, and I change my mind! This was stamped by Vickie Kahlandt using the Tea For Two DSP (spring mini, retires May 31) and Stipple Blossoms stamp set, which is carrying over to the new catalog! Love the natural ribbon and the flower in blues. Rhea Hughes is a talented stamper that I swap with once a month . 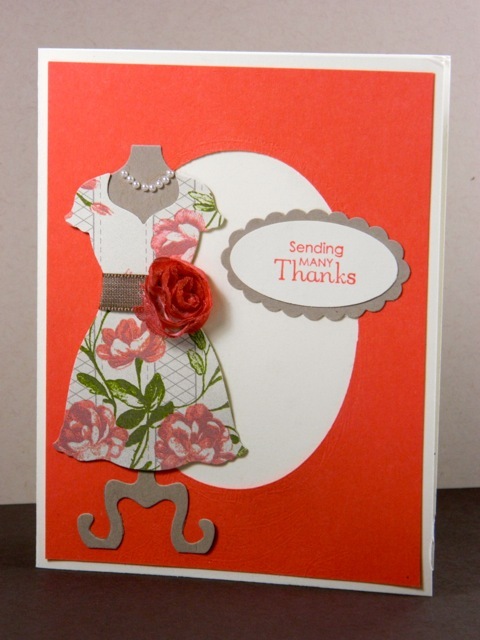 This cute card is easy to make with the Dress Up Framelits (yes, going into the new catty) and the Tea For Two DSP (retires end of this month) The little vanilla fabric flowers on a roll retire this month also. So sad they didn’t make it into the new catalog and I love dying them with my aquapainter and reinker like Rhea did here in coral. This swap is so awesome! Thank you, Cindy Fodor! The larger than life ants are a little scary like a cheesy horror flick but it’s the stamp scale 🙂 The fire label on the left side is createdwith torn paper and sponging. 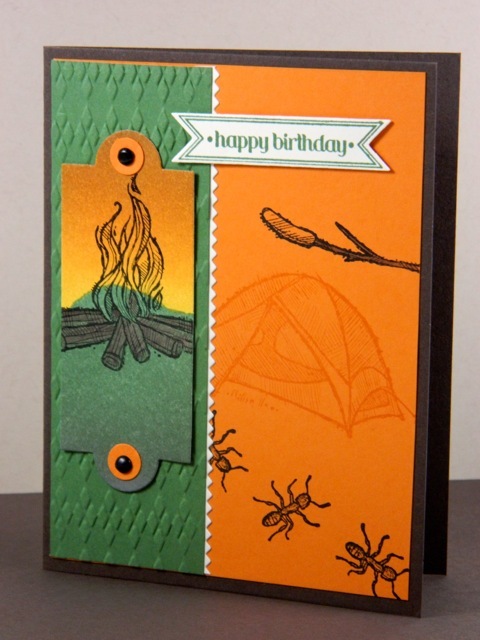 I love having a great camping card! 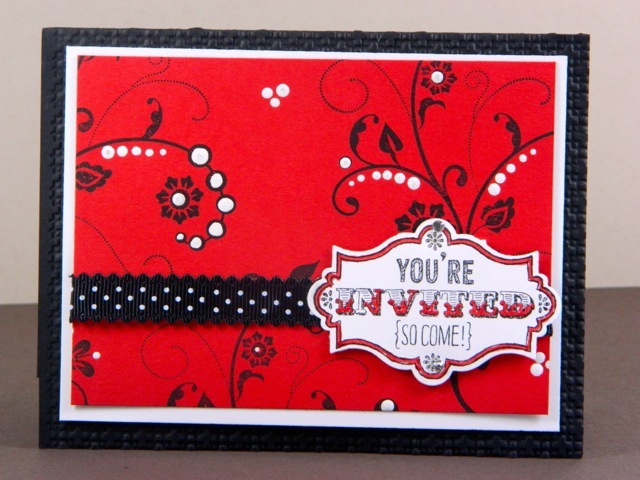 Jackie Walker stamped this pretty card for our team meeting swap and landed 1st place in the contest! 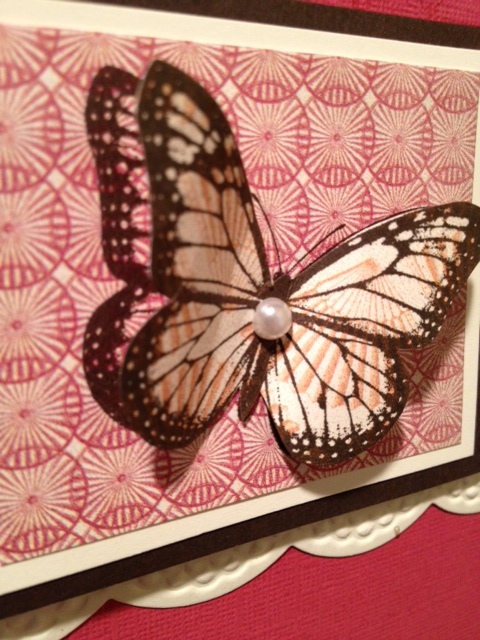 Here is a close up of the butterfly where she stamped it on the Fan Fair DSP (retiring end of the month) and then layered it on another pattern of the Fan Fair dsp. I think this one is Carol Gilmore (no last name) If I’m wrong, please let me know! My swaps got a little jumbled up between Fiji and my other swaps but I love this Americana style card. 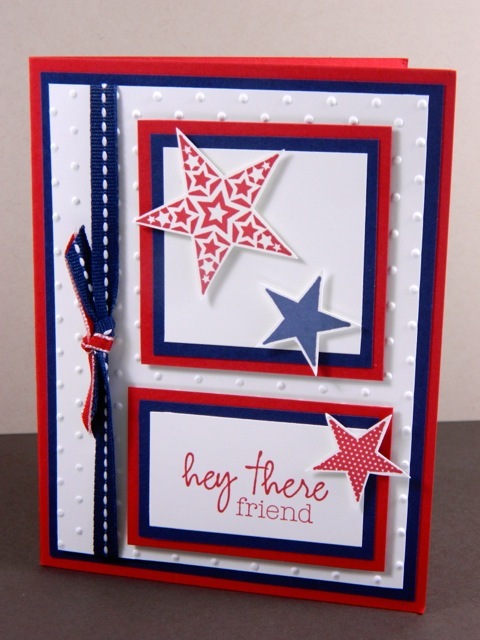 It’s a new stamp set called Simply Stars and you will find it on page 124 of the new SU catty starting May 31st. I just wish we had star punches but I did save mine for such an occasion! 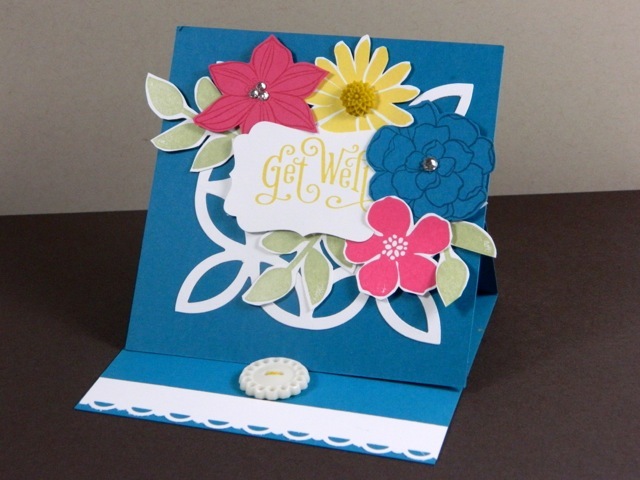 A summery easel card by Patti Sharkey, one of my team here in Florida. 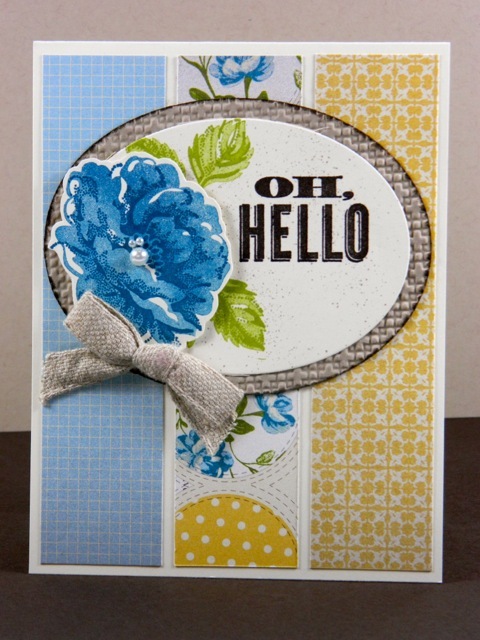 That lattice die is carrying over to the new catalog again this year -yippee! Tune in tomorrow for part 2 swaps! Hey Linda- here I was stalking your blog and low and behold there is my card! I love the bandana technique~ I used acrylic paint and my stylus. Just dip the stylus into the paint and then start making dots! They automatically get smaller and smaller ~ it is so easy! It’s an awesome card! Love it!!! Hi Linda! I actually just colored my flower with a sponge dauber and ink. Really quick and works well. Nice to see Diane Dimich’s card here too. She is good friend and fellow Montanan!